Recent federal court decisions appear to limit the ability of cities to mitigate the ambient crime risks associated with adult entertainment businesses. In one instance, a court has assumed that criminological theories do not apply to “off-site” adult businesses. 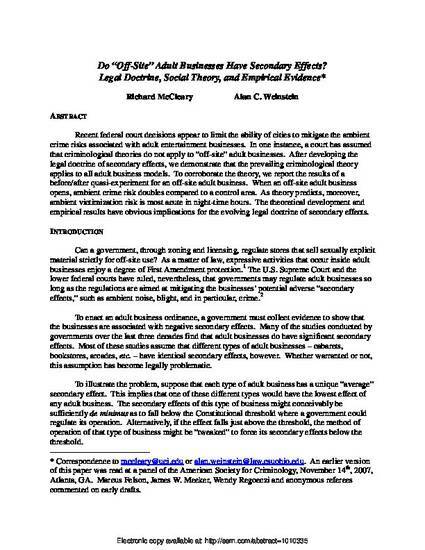 After developing the legal doctrine of secondary effects, we demonstrate that the prevailing criminological theory applies to all adult business models. To corroborate the theory, we report the results of a before/after quasi-experiment for an off-site adult business. When an off-site adult business opens, ambient crime risk doubles compared to a control area. As theory predicts, moreover, ambient victimization risk is most acute in night-time hours. The theoretical development and empirical results have obvious implications for the evolving legal doctrine of secondary effects.